Synthesia produces high-quality grades of Diethylether. This oxygenous solvent is environmentally friendly and is being produced in 3 grades. Diethylether Technical grade is a standard grade. . Synthesia also offers Diethylether Pure Grade with parameters in accordance with pharmaceutical standards of European Pharmacopoeia and Diethylether p.a. Diethylether Pure Grade can be stabilised by Phenidone or BHT. 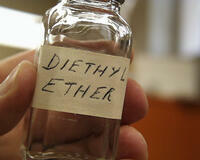 Diethylether can be supplied along with Nitrocellulose. Technical Grade is often used in the production of smokeless powders. Diethylether Pure Grade is being used mainly in pharmaceutical industry and Diethylether p.a. mainly in laboratories as a fine chemical. Synthesia is a major supplier for domestic czech market and plays significant role on the european markets as well.